Scanning of QR code and barcodes in online shopping and transactions have become quite common: the credit goes for the easy availability of user-friendly and advanced QR code and barcode scanner apps. However, all the apps available online are not equally useful and not all of them work for iOS users. If you are an iOS user and wish to know the names and the outline details of the most versatile and user-friendly Barcode and QR-Code Scanner Apps for iPhone, read here: we have researched thoroughly to give you the name and details of the best apps available in the Apps store to help you quickly reach the information inside a QR-code. Tips: If you accidentally lost or deleted photos on iPhone, including the QR code image just saved/taken, you can always use Jihosoft iPhone Data Recovery to get them back from iPhone or iPhone backups. 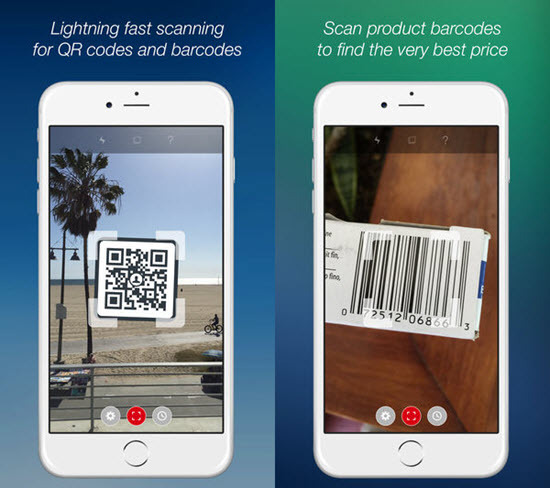 This is a user-friendly Barcode and QR-Code Scanner app for your IOS device. 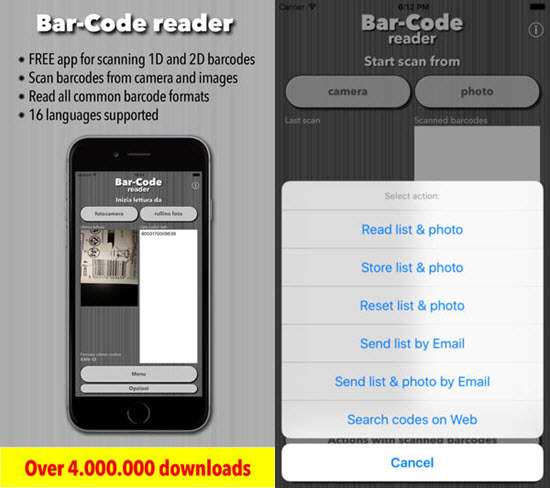 With this app you will get to scan all standard IDS and 2D type codes. It comes with a built-in flashlight and that is why even in darkness the app works perfectly as a scanner. The app saves the entire scan history, which allows you to easily access all the scans on iPhone. The app supports multiple languages like English, Arabic, Dutch, French, Portuguese, German, Indonesian, Italian, Japanese, Korean, Simplified Chinese, Russian, Spanish, Thai, Traditional Chinese, Turkish, etc. It is a speedy app and the results are accurate always. It is built with flashlight and that is the reason, you can use it even in darkness. The app saves all scan history so that you can check them later and if needed you may share the scanning result via SMS, Email, Twitter, and Facebook. The app is built with user-friendly and navigation-friendly interface, and this scanner app is compatible with multiple languages like English, French, Lithuanian, Russian and Spanish. 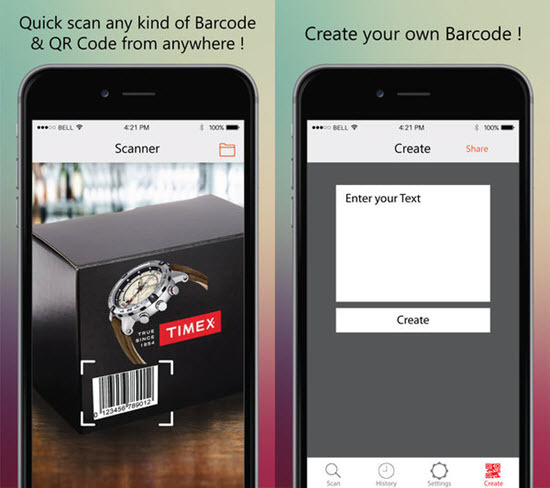 The app QR Code & Barcode Scanner is extremely efficient in terms of functionality and the app is supported by Apple’s in-built scanning technology for generating accurate result. Another premium feature of this app is its support for multiple code formats including QR code EAN 13, EAN 8, UPC-A, UPC-E, Code 128, Data Matrix and more. Furthermore, you can use iCloud to keep all data synchronized all across the compatible devices like iPhone. The app will allow you to store your scanned data in Dropbox and G-drive for enhanced security. Furthermore, the app will allow to export your scanned data in CSV format and export them in Apple’s Numbers Spreadsheets app. 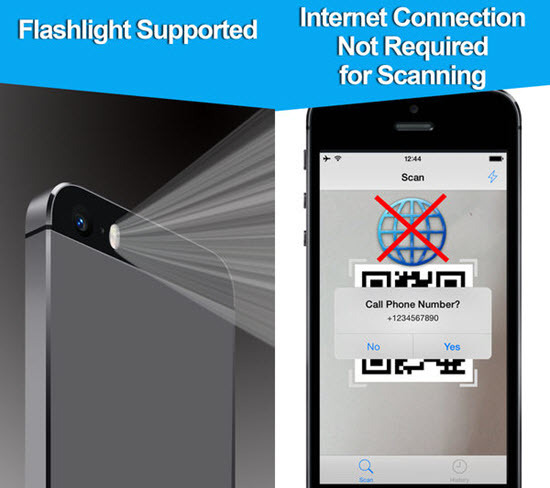 It is a typical scanner app for iPhone with a handy interface. It has several user friendly features like saving of history, which the user may view later. The app can help a user to extract information about a product from its barcode. It is a fast app and it is quite reliable in terms of its straightforwardness. 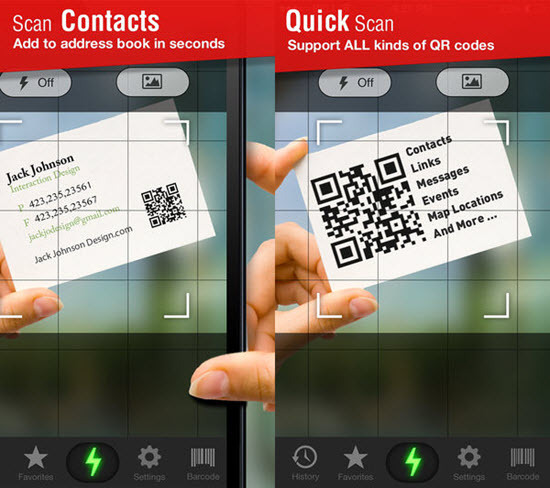 Quick scan is an efficient QR code scanner app for iPhone. 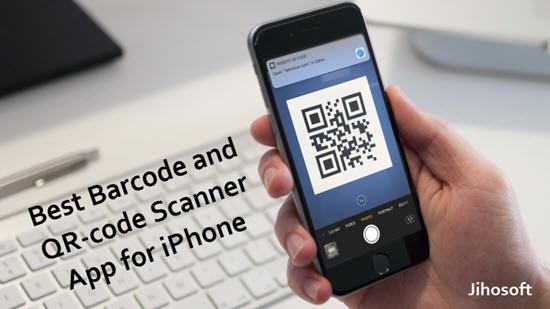 The app can scan and decode wide varieties of QR codes including contact detail, website URL, calendar event, telephone number, SMS message, and many more. The QR code can be shared by text message or via email. 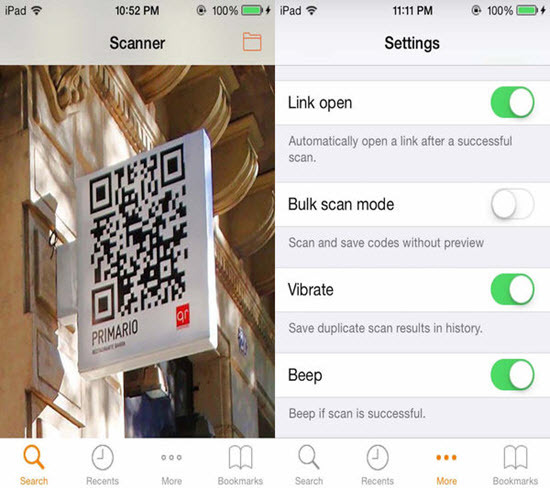 The app preserves a scan history so that you can access all the scanned QR codes. 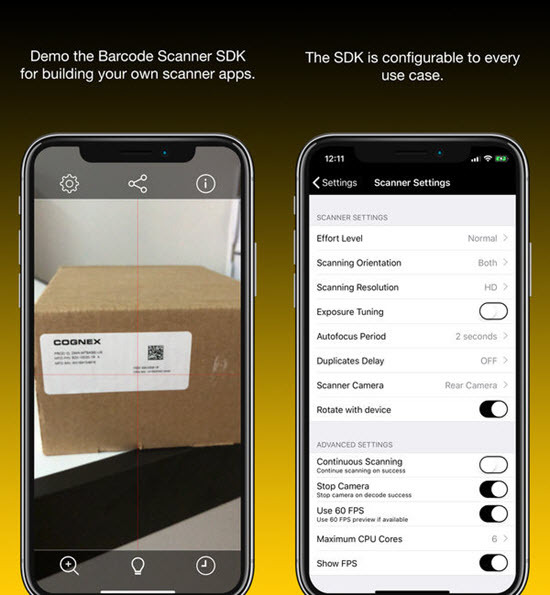 Simple scan is an efficient scanning app for barcode and QR code on iPhone, even when there is a bulk requirement for scanning. Its bulk scanning feature will permit you to scan multiple numbers of QR codes at one go. The app can read QR Code and barcode even from photos. Once the scanning is complete, the app vibrates or beeps for the signal of confirmation of the done task. Magic Scanner is a versatile scanner app for iPhone that can scan almost all kinds of commercial barcodes, for example, UPC, EAN, ISBN, etc. With the help of this app you can search product prices as well as product details from retailers like Amazon, BestBuy, Wal-Mart, etc. If you want to share product links, you can do it by using this scanner app and results will be shared at Twitter, Facebook, email, etc. The scanner app Scan is functional and it is easy to use even for the beginners. Its simplicity is the main USP of this iOS application. Decoding codes in phone numbers, opening links or for opening calendar…all the activities are done properly by this app at your best ease. Scanning quality is also good on iPhone. This is not the latest app available in App store that will help you in scanning QR code and barcodes, but it is an old player in market hence it is completely reliable. It is built with quintessential features, but all the features are meant for keeping the scanning activity simple and well-manageable, you will get to track all scanning jobs done and you will get the snap of stuff you have just done with the scan. 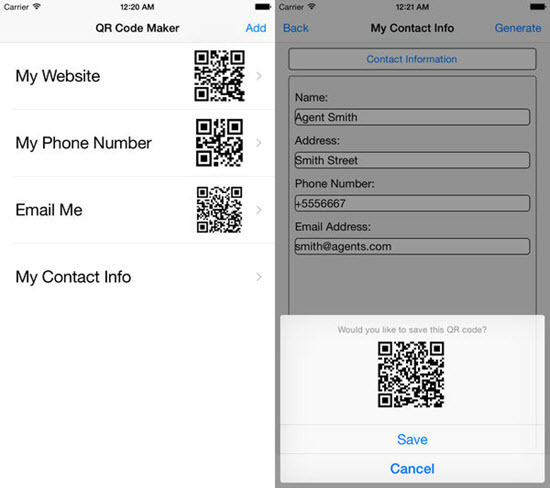 If you want to make a QR code on iPhone, the app QR code maker will help you to get your job done. The app will help you to generate QR code almost instantly and data like your name, phone number, email, link to a website, a product can be used for making QR code. 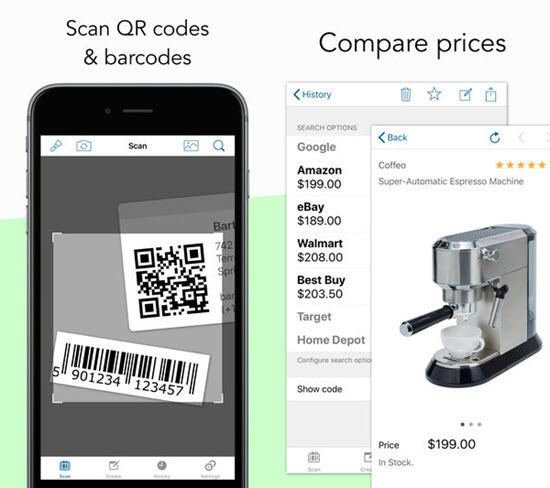 These are the 10 best QR code and barcode scanner app available in the Apps Store suitable for using on iOS devices like your iPhone. With any of these apps, you can easily catch the information of a product or something else on your iPhone from any kind of QR-codes and bar-codes. Users have reviewed these scanner apps as extremely beneficial and functional. Do let us know if you have used any of these apps and your experience about the app. We will be happy to hear from you!